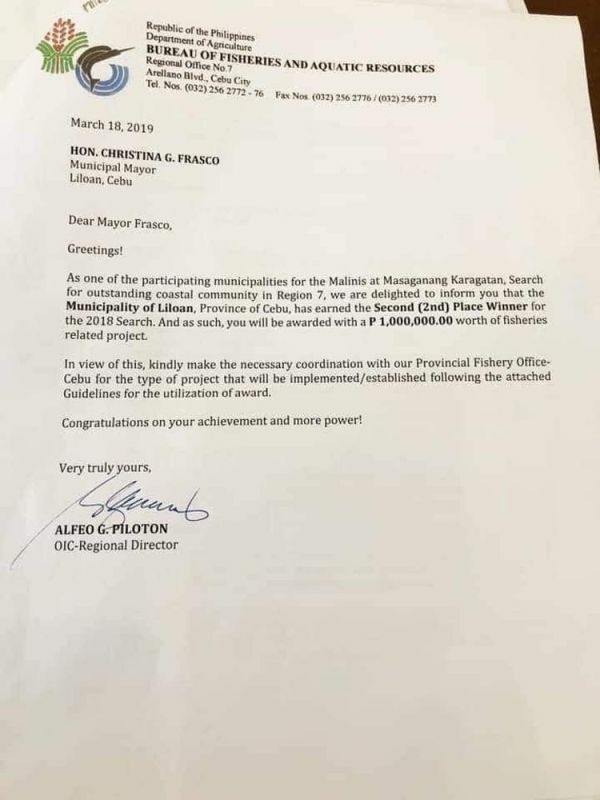 FISHERIES related projects amounting to P1 million await the northern town of Liloan, Cebu for winning second place in the 2018 search for the Most Outstanding Coastal Community in Central Visayas. The pronouncement was made by Bureau of Fisheries and Aquatic Resources (BFAR) Central Visayas officer-in-charge Alfeo Piloton in a letter addressed to Mayor Christina Frasco last March 18. “In view of this, kindly make the necessary coordination with our Provincial Fishery Office-Cebu for the type of project that will be implemented or established,” reads portion of the letter. Frasco, for her part, welcomed the development. She also uploaded a photo of the letter in her Facebook account Monday afternoon, April 15. “I thank our hardworking team under the Municipal Agriculture Office headed by Sir Ireneo Noval, our Bantay Dagat Personnel and Task Force, our MENRO (Municipal Environment and Natural Resources Office) headed by Sir Roland Tabuñag, our local government officials and the members of our fisherfolk community and fellow Liloanons for their efforts at ensuring maritime conservation!" Frasco wrote. Through its Malinis and Masaganang Karagatan program, BFAR recognizes the efforts of coastal municipalities in protecting and conserving marine resources. The program has four general criteria, which includes the absence of illegal fishing and observance of fishing closed season; establishment of protected marine sanctuary; clean coastal waters without domestic and industrial wastes; effective mangrove protection and rehabilitation program. A national technical search committee has been created to specifically evaluate candidates based on the criteria.